The biggest change in this release is the improved import/export feature. 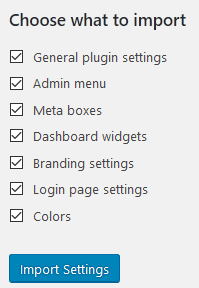 Previously, you could only export some parts of the plugin configuration like the admin menu and dashboard widgets. You also had to go to each individual tab to export the settings in that tab. This version adds a new “Export” tab – a central location for all your configuration export needs. You can also export much more of the configuration, including meta box settings, plugin visibility, Branding add-on settings (if you have that installed), submenu icon settings, UI color scheme settings, and more. There are still some things that cannot be exported, like some debugging settings. If you notice anything important missing, let me know. Once you have an export file, you can import it through the “Import” tab. The old import/export features like the “Export” button in the menu editor are still in place and still work like they did before, at least for now. They will be removed in a future release because having multiple “Export” buttons that all do different things would probably be confusing.